5 drawings on paper (1 sheet) : ink ; 9.5 x 6 in. 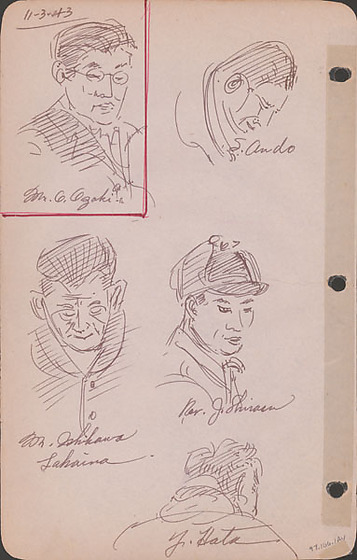 Ink portraits of five men from the neck or chest up, identified by inscriptions. Top left portrait of Mr. O. Ozaki is framed by dark and light red right angle lines ; his eyes are downcast behind glasses and hair is swept back; he wears a suit viewed from chest up. Top right portrait of Mr. S. Ando depicts a man from shoulders up bent forward with close-cut hair. Middle left portrait of Mr. Ishikawa of Lahaina, Maui depicts a man with head bent and eyes downcast wearing a buttoned jacket facing viewer. Middle right portrait of Reverend J. Shirasu depicts from the shoulders up, a man in three quarters turn wearing a cap with downcast eyes. Bottom left portrait of Mr. Y. Hata from the back, shoulders up ; scarf around neck. Drawing 97.106.1AU on recto on same sheet. Written in black ink, top left corner: 11-3-43. Written in black ink below or on each image: Top row: Mr. O. Ozaki, S. Ando ; Middle row: Mr. Ishikawa / Lahaina, Rev. J. Shirasu ; Bottom row: Y. Hata.